Happy Birthday to my little brother. He’s 25 today. I know people say this all the time, but I seriously can’t believe how fast time goes!! I swear it was only yesterday I was making him dress up in mum’s old dresses and play dolls with me. Thanks for being such a great brother and letting me boss you around all the time. We were at the Hyde Park Community Fair this past weekend. Thank you to everyone that stopped by, said hi and tried our cakes!! 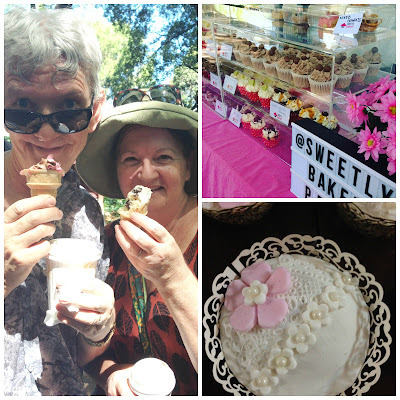 We were overwhelmed with demand and ran out on Sunday – which meant a long night of baking for Monday! We made some super cute “ice-cream” cone cupcakes for the weekend at the fair. Everyone loved them, big kids as well! We also brought back the Cadbury Creme Egg Cupcakes for Easter. omnomnom. How cute are my parents eating their ice-cream cone cupcakes. It was also a long weekend here in WA, which is always lovely!! Update on the Doughnut ice-cream cones – they’re available in Perth!! and made by the awesome team at Lena-Lu! Cake Lace. I think I’m in love. I’ve seen it around, and I’ve seen some incredibly beautiful baked goods that use it. But how have I not used this before?! I think I’m going to find a way to put it on all my cakes for the future. Today is International Women’s Day. I saw an ad last night that I originally thought was about encouraging women/females to try things that they wouldn’t normally, and showing that females can do the same things that males can – turns out it was actually an ad encouraging women to exercise.. I’m not sure I like it the same now.